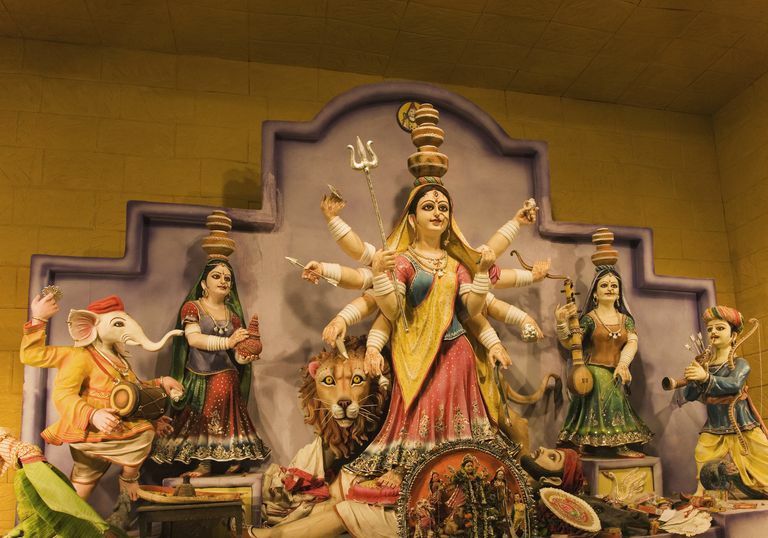 For Hindus, the mother goddess Durga is a very special deity, able to appear in nine different forms, each of which is endowed with unique powers and traits. Together, these nine manifestations are called Navadurga (translated as "nine Durgas"). Devout Hindus celebrate Durga and her many appellations during a nine-night festival called Navaratri, which is held in late September or early October, depending on when it falls on the Hindu lunisolar calendar. Each night of Navaratri honors one of the mother goddess' manifestations. Hindus believe ​that worshiping Durga with sufficient religious fervor will lift the divine spirit and fill them with renewed happiness. Navaratri begins with a night of worship and celebration in honor of Durga's avatar Shailaputri, whose name means "daughter of the mountains." Also known as Sati Bhavani, Parvati, or Hemavati, she is the daughter of Hemavana, the king of the Himalayas. Shailaputri is considered to e the purest embodiment of Durga and the mother of nature. In iconography, she is depicted riding a bull and holding a trident and a lotus blossom. The lotus represents purity and devotion, while the prongs on the trident represent the past, present, and future. On the second day of Navaratri, Hindus worship Brahmacharini, whose name means "one who practices devout austerity." She enlightens us in the magnificent embodiment of Durga with great powers and divine grace. Brahmacharini holds a rosary in her right hand, representing the special Hindu prayers recited in her honor, and a water utensil in her left hand, symbolizing marital bliss. Hindus believe she endows happiness, peace, prosperity, and grace upon all devotees who worship her. She is the way to emancipation, called Moksha. Kushmanda is the fourth form of the mother goddess, and her name means "creator of the universe," for she is the one who brought light to the dark cosmos. Like other manifestations of Durga, Kushmanda has multiple limbs (usually eight or 10), in which she holds weapons, glitter, a rosary, and other holy objects. The glitter is particularly significant because it represents the sparkling light that she brings to the world. Kushmanda rides a lion, symbolizing ​strength and courage in the face of adversity. Kalaratri is also known as Shubhamkari; her name means "one who does good." She is a fearsome-looking deity, with a dark complexion, disheveled hair, four arms, and three eyes. Lightning issues from the necklace she wears and flames shoot from her mouth. 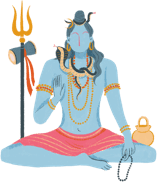 Like Kali, the goddess who destroys evil, Kaal Ratri has black skin and is worshipped as a protector of Hindu faithful, one to be both honored and feared. In her left hand, she holds a vajra, or spiked club, and a dagger, both of which she uses to fight the forces of evil. Her right hands, meanwhile, beckon to the faithful, offering them protection from darkness and allaying all fears. Mahagauri is worshipped on the eighth day of Navaratri. Her name, which means "extremely white," refers to her luminous beauty, which radiates from her body. Hindus believe that by paying homage to Maha Gauri, all past, present, and future sins will be washed away, imparting a deep sense of inner peace. She wears white clothes, has four arms, and rides on a bull, one of the most sacred animals in Hinduism. Her right hand is in the pose of allaying fear, and her right lower hand holds a trident. The left upper hand holds a damaru (a small tamborine or drum) while the lower one is thought to grant blessings to her devotees. Siddhidatri is the final form of Durga, celebrated on the final night of Navaratri. Her name means "giver of supernatural power," and Hindus believe she bestows blessings upon all deities and devotees of the faith. Siddhidatri grants wisdom and insight to those who appeal to her, and Hindus believe that she can do the same for deities who worship her as well. Like some of Durga's other manifestations, Siddhidatri rides a lion. She has four limbs and carries a trident, a spinning disc called a Sudarshana Chakra, a conch shell, and a lotus. The conch, called a shankha, represents longevity, while the spinning disc symbolizes the soul or timelessness.